Join a drum corps for a day, and take your marching experience to the next level with instruction from DCI (Drum Corps International) instructors! We have a full schedule of activities planned for this unique Drum Corps Experience Day. Register for one track, either brass, percussion, or color guard. For those interested in receiving drum major instruction, we will have a breakout session with an experienced DCI conductor. What if you are a woodwind player? This drum corps experience camp is the perfect opportunity to gain more experience in a drum corps section, either brass, percussion, or color guard. Wait — Are You Bringing a Group? Consider bringing a group from your high school or independent ensemble to have an incredible effect on the success of your team! Directors, staff, and parents who can organize a group should email DeLano Bonner to find out about the group discount! 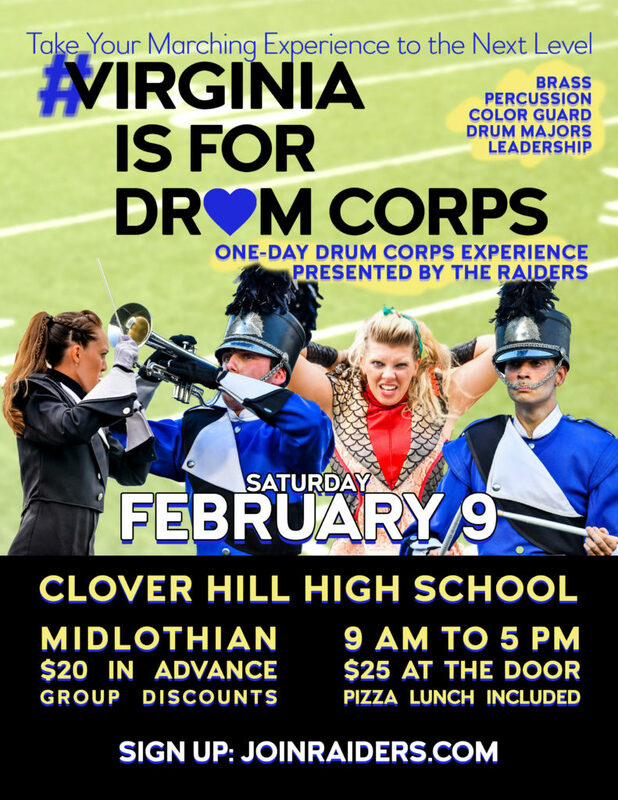 The #VirginiaIsForDrumCorps Experience Day is being presented by the Raiders Drum and Bugle Corps, a Drum Corps International (DCI) Open Class organization based in Burlington, New Jersey. Many members of the Raiders instructional staff are music or pageantry educators also employed by public school districts. They have extensive experience instructing music and movement. Our activities are appropriate for students in middle school, high school, and college. Any level of experience is welcome. Beginning and experienced performers will receive instruction that will be challenging with attainable goals. For attendees who register in advance on this website, the cost will be $20. Anyone who does not register in advance and plans to attend will pay $25. The cost includes the instruction from professional educators, access to the world-class facility, and a pizza lunch. We are offering a group discount. Contact delano@raidersdbc.org for details. This is an excellent opportunity for school and independent programs to bring a group of students to gain consistent instruction to take performance skills to the next level. Registration is now closed! Thank you for attending. Stay tuned for more Drum Corps Experience Days from the Raiders.